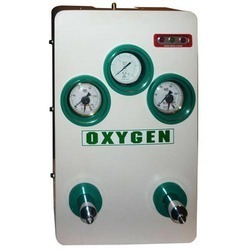 Our esteemed customers can avail from us superior quality Medical Gas Control Panel at highly competitive prices. These panels are designed in compliance with the international quality standards, by a team of experts. The entire range of Medical Gas Control Panels is widely appreciated for its efficient functioning and user-friendly interface. In our range, we offer Automatic Medical Gas Control Panels and Semi Automatic Medical Gas Control Panels. We are engaged in offering high quality Automatic Digital Gas Control Panel in the market. These panels are made by a team of experts by employing the most modern technology and machinery. In addition to this, we check these panels on certain well-defined parameters prior to their dispatch. We are instrumental in offering excellent Semi Automatic Control Panel to the esteemed clients. The panels offered by us are manufactured in compliance with the ISO 9001:2008 standards. These products are manufactured using SS or MS, as per the clients’ requirements. Moreover, these panels are duly powder coated with excellence. 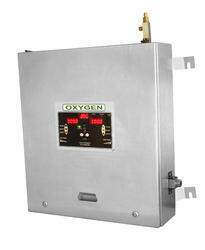 Our company specializes in offering qualitative range of Medical Gas Control Panel. User-friendly, accurate results, high performance and longer service life are some of the highlighting properties of our products. All these products are stringently examined by our quality controllers to ensure that all our products are free from any kind of defects and are flawless in nature. Our patrons can avail this range according to its requirements. Switchover gas manifolds provide a standby gas supply form two equal bank of cylinders, with automatic changeover. The manifold is convenient through regulating gas cylinders pressure to provide uninterrupted gas. 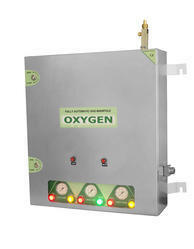 It provides a cost effective solution to traling hoses around the operating room. The automatic changover is done through a Fully Automatic Gas Control Panel. Fully automatic with manual reset. Lockable metal outer cover provides durability and fire-resistance enhanced safety. Automatic switch by saddle valves between two gas sources and is used for refilling gas. Pressure-reducing design maintains a reliable stable output pressures. pressures gauge/LED display shows clearly the pressure at each gas source and the totel pressure at the outlet. Full bore valves for maximum pressure loss can be locked in open or closed positions. Provides maintenance or major works thorugh isolation facilities of gas distribution systems.